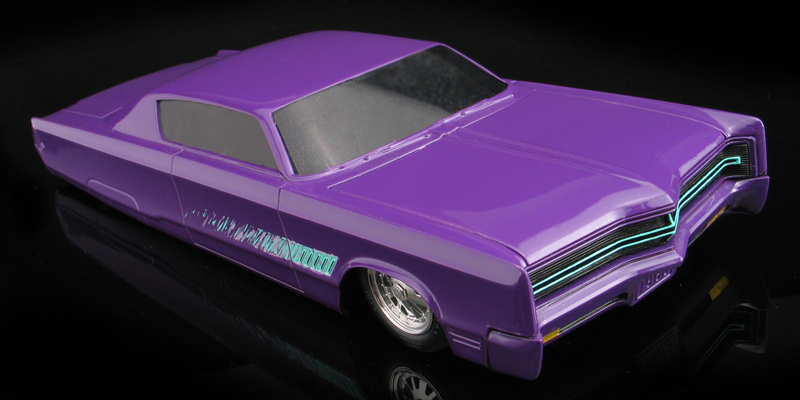 I built this chopped-top, custom 1968 Chrysler 300 from a stock Johan model car kit back in 1989. It's a full on '80's period custom with all the popular custom tricks of that era: pastel purple paint, brush-stroke graphics, painted bumpers and 16" Boyd's billet wheels. It looks kind of dated today, but back when this model was built, these custom tricks were all the rage and this model gathered a lot of attention. Back then, I used to go to lots of model contests around the mid-west. My Chrysler debuted at the '89 NNL in Toledo. There, it was photographed and then featured in Scale Auto Enthusiast magazine. Seville Enterprises, (the current owners of Johan at that time) saw the model in the magazine and sent me a letter telling me how impressed they were of my model. They even sent me a case of new Johan kits and told me to keep building! That was a fun time to build models. Also, back in the '90's there was a popular style of model building called "slamming." The idea behind it was just to quickly "slam" a model together without a chassis or interior. The windows were then blacked out to hide that fact that the model was an empty shell. These models were built without much detailing and we just built enough of the body so they looked cool sitting on the shelf. The wheels were placed up inside the body and glued on however they would stick. It was a perfect way to get a radical looking model without having to spend tons of time on it. I built a bunch of these style cars because I had lots of ideas for hot rods swirling around in my head and this was a fast way to see them in 3-D. My Chrysler "slam model" is an example of this style of modeling. Contest tables use to be full of this style of model, but for some reason, "slammers" seem to have lost fashion and I rarely see anyone build one like this anymore. My custom 300 was sort of inspired by a similar real Chrysler 300 lead sled that use to cruise around in my home town of Springfield, Ohio. That particular car had a chopped top and looked very menacing. It stuck in my head and I decided to build my own version. For my custom '68 Chrysler 300, I chopped the top and leaned the front windows back and rear windows forward to visually stretch the car's already massive length. I also filled in the fender skirts to hide the rear wheels and make it look like the tail of the car is dragging the ground, lead sled style. The door handles and side moldings were also shaved. The vent windows were also removed for a cleaner flush glass look.The rear of the car features aluminum tube exhaust tips that exit through the rear bumpers. I painted the "Miami-Vice style" pastel turquoise and pink brush-stroke graphics by hand.